Ready for Black Sails?! Great — it’s available right now! If you’re stoked for the Black Sails premiere next week, you’ll pee your pants over this news: You can watch it right now! That’s right. Starz has made the first episode available online, and you’ll find it at the bottom of this page. 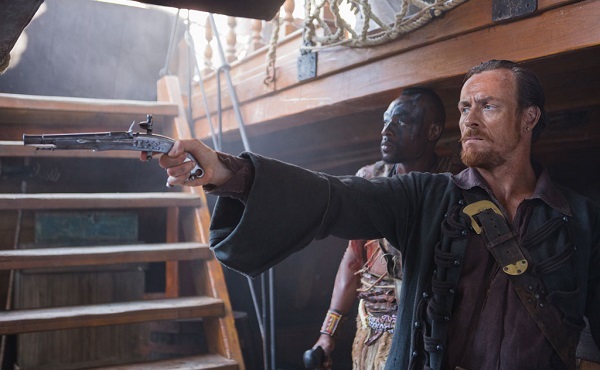 If you’re still reading, we assume it’s because you’re not familiar with Black Sails. Set 20 years before Robert Louis Stevenson’s novel Treasure Island, the TV show Black Sails follows the adventures of Captain Flint, his ship and his sailors. But trouble brews when Flint hires John Silver. They may begin by fighting alongside each other, but they’ll soon find themselves at odds. Their “safe” harbor of choice is New Providence Island, a place that seems to be specifically geared toward pirates. The island is teeming with shady characters, from more pirates to prostitutes to the people who enjoy services rendered by the ladies of the night. What should you expect from the new series? A little of everything. There will be scandalous affairs, mutiny and murder. One beloved daughter may even fall for the wrong guy (not exactly a new plot twist, but still an interesting one). Our favorite part: Those slightly grungy pirates, obviously. The series is so good that Starz has gone ahead and renewed it for a second season before the first episode has even aired. If you want to catch Black Sails from the comfort of your couch and on your wide-screen TV, the new show premieres Jan. 25. If you’re too impatient to wait that long, watch it now, right here!